Pope Francis' very public friendship with and overtures to Pentecostal and evangelical leaders is a high-profile reflection of a relationship that already existed at the grass roots between Catholic charismatics and some of their Spirit-filled neighbors, leaders of the renewal said. While some Pentecostals in some parts of the world, especially in Latin America, have a reputation for trying to convince Catholics to leave the church, the reality of the Catholic-Pentecostal relationship is much more varied. In many places, they share praise, worship, music and Bible studies with Catholic charismatics, and they set out together to proclaim to all that Jesus is Lord and work alongside each other to feed the poor and defend the unborn. Pope Francis invited some 300 Pentecostal and evangelical leaders to Rome to join an estimated 30,000 Catholic charismatics in celebrating Pentecost and marking the 50th anniversary of the Catholic charismatic renewal. Introducing the celebrations, which were to take place on May 31-June 4, Salvatore Martinez, president of Italy's Renewal in the Holy Spirit, called the charismatic and Pentecostal movements "the greatest spiritual awakening of the 20th century," and noted how similar movements of the Spirit impacted the Anglican, Protestant, Catholic and Orthodox churches. Recognizing that "it is precisely the Holy Spirit who heals divisions," he said, Pope Francis wanted an ecumenical celebration. In fact, many charismatic communities have a mixed, ecumenical membership, said Michelle Moran, president of the Vatican-based International Catholic Charismatic Renewal Services. In addition to shared prayer and action, she said, Catholic charismatics have been involved in the official theological dialogue with Pentecostal Christians. The Vatican-sponsored dialogue with Pentecostals and evangelicals is somewhat different than its other ecumenical dialogues, which are working toward a restoration of full unity, including in doctrine, ministry and the sacraments. "Catholics, Orthodox, Anglicans and mainline Protestants all come from the same tradition and historical experience of the church of the first millennium and more," explained Bishop Brian Farrell, secretary of the Pontifical Council for Promoting Christian Unity. "Pentecostals and evangelicals," he told Catholic News Service, "come from a very different historical experience; they have an entirely different understanding of church, sacrament, ministry, mission. The aim of dialogue, then, has to be different. "With these new religious groups the ecumenical goal is greater mutual understanding and cooperation in witnessing the Christian message," he said, noting that with many of them the Catholic Church agrees on "fundamental moral and ethical issues," which gives room for practical cooperation in defending and promoting the biblical vision of human person and society. While some Pentecostals have an "exclusivist and anti-ecumenical, sometimes especially anti-Catholic" attitude, many others focus on shared faith in Jesus and a shared experience of the outpouring of the Holy Spirit, Bishop Farrell said. 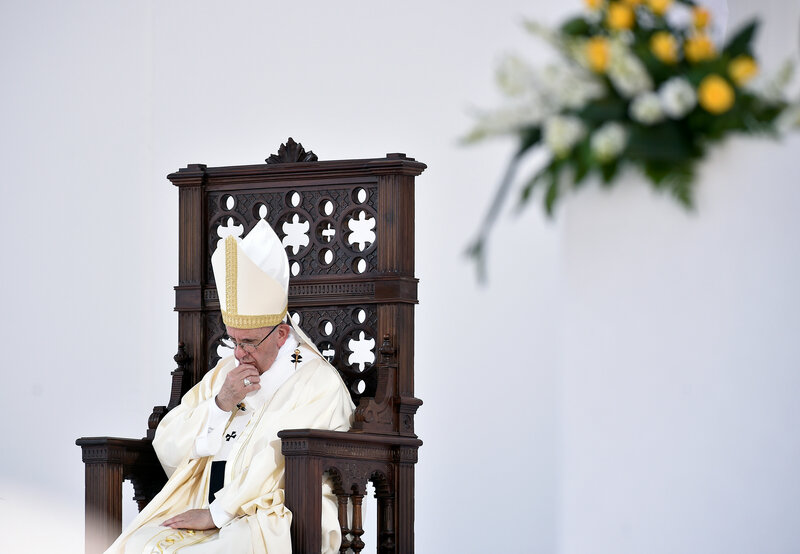 "Where dialogue is possible," he said, Pope Francis "is ready and willing." And, he said, when other groups are attracting Catholics, the first question should be "What is lacking in our pastoral care? Are Catholics sufficiently attentive to the word of God in the Scriptures? Do they have a positive image of God and a positive experience of life in their local church? In their parish and neighborhood, do they build a real, operative community in solidarity and mutual care? "The fact that so many Catholics and Protestants are drawn to the new religious groups is a call for a sincere examination of conscience and much hard work," the bishop said. Where the Catholic charismatic relationship with Pentecostals is positive, it provides an example of "spiritual ecumenism," which is less about agreement on theological points and more about common prayer. But the relationship also is an example of what is called "receptive ecumenism," the process by which divided Christians recognize that each other has gifts they can benefit from, too. Catholics have much to offer Pentecostals, starting with the liturgy and its mystery and sense of sacrifice, Martinez said. But also, with such a strong focus on reading the Bible, Pentecostals also benefit from the writings and reflections of the early church theologians. "They are an inestimable treasure for all Christians," and offer important guidance for reading and understanding the Scriptures. From the Pentecostals, Martinez said, the first thing Catholics can learn is "love for the Holy Spirit, who remains the great unknown for Catholic theology." Another thing, he said, is the sense of fraternity and community Pentecostals experience, even in their megachurches. "In our parishes and churches we sometimes can feel anonymous. In evangelicalism in general, one sees this focus on the individual and on spiritual accompaniment as a great grace." For Bishop Farrell, Pentecostals often excel at the kind of joy and enthusiasm for sharing the Gospel that Pope Francis constantly encourages. "The direct experience of God's saving grace is the perfect antidote to a faded, weak faith and to that kind of cultural Catholicism that too often prevails," the bishop said. "Personal engagement in evangelization, involvement in genuine actions of service to others, a sense of thankfulness to God for every blessing and even for every trial in life. This is what we can learn right away from our charismatic brothers and sisters. And it is not something secondary and incidental."